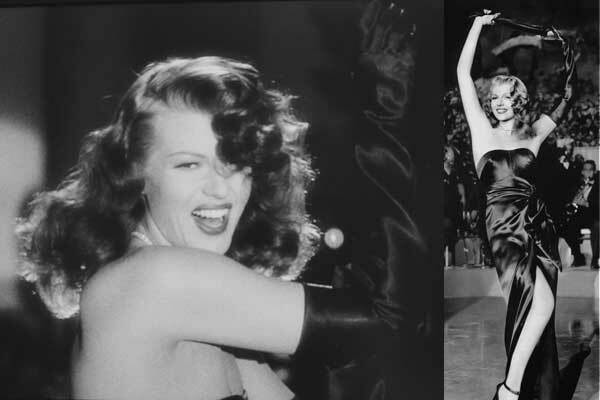 As I make my way through the vaults of classic movies, every once in a while I notice a particular element or detail cropping up again and again across the board- fur, rhinestones, and bows for example. I thought it would be fun to pick a theme and follow it for a bit, then give some ideas on how to incorporate that detail into your modern wardrobe. I’ll start with the hardest one first- bows. This is hard for me because I see bows as essentially girly, and even a little immature, which is not at all how I would identify my personal style. Yet, when I see it in a classic film the character almost always looks so elegant- there must be some particular trick to pulling it off. We’ve already seen bows incorporated in interesting ways in a few movies here so far. 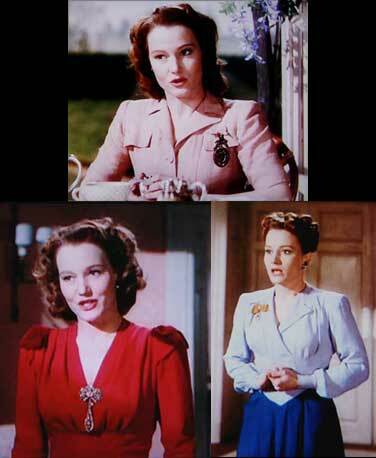 In Blithe Spirit (1945), Ruth wears a red robe that substitutes bows for epaulettes. They are structured velvet bows in a shade slightly darker than the rest of her robe. 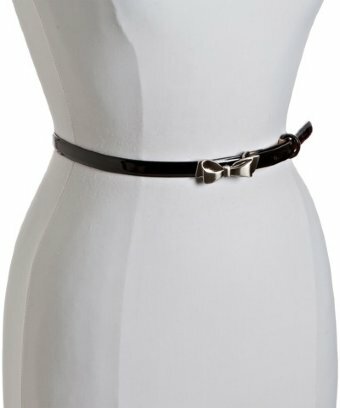 In All About Eve (1950), Eve sports a little black dress with a high georgette neckline, gathered and tied off with a small ribbon bow. 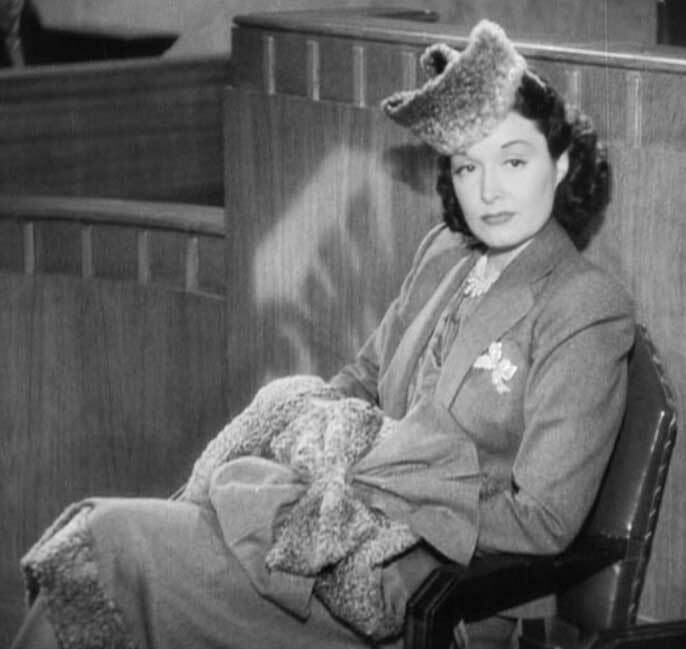 In My Favorite Wife (1940), Ellen wears a vintage dress (early 1930s) that has a gigantic double bow in contrasting black and white polka dots, set askew at the neckline of her overcoat. Bianca carries that muff/ purse with a big bow, and also sports a rhinestone bow brooch styled with ripples, so it looks like it is caught in a breeze. In vintage fashion, you can find bows on accessories as well- hats, bags, pins, headbands, belts, shoes, etc. So, now that you are looking for bows all around you, let’s delve into the psychology of bows. This is where I pretend to be a psychologist and/ or fashion historian, and you can pretend to believe me (or not). Just note that I have no background or any relevant training, and a fairly extensive google search yielded not much more than frustration over my inability to distinguish between “bow (fahion)”, “bow (and arrow)” and “bow (and curtsy)”. First, consider the difference in meaning between when a man wears a bow as a bow tie with an every day suit or a tux, and when a woman sports a bow in any other capacity. That man is either a nerd (traditional or rebellious), or James Bond. What exactly is the woman? Are there distinctions in meaning among different kinds of bows including shape, placement, and functionality? Do her bows give an indication of maturity and style? If a bow is in place as a structural element it is there to serve a purpose, i.e. to hold two things together, like the sides of a robe or wrap dress, or like the gathers in Eve’s neckline. A woman might look at a bow and think, “Job well done, I am nicely put together!” A man might look at a bow and say, “How easily can I untie that and what will happen then?” That bow is at once a triumph over chaos and a challenge to potential disorder. Bows as decorative elements are another consideration entirely. You can have big, floppy bows or small, structured bows; bows with tails or without; bows placed at the neckline, waistline, forehead, or posterior. Bows draw attention wherever they are- remember the 80s with gigantic bows on your prom dress? Why did you think that was a good idea? In vintage clothing, it seems like bows are used to subvert normally masculine elements into feminine. Like Ruth’s bows standing in for epaulettes, and the 70s blouses with thin, floppy bows at the neckline replacing the more traditional neckties. We can’t all be Diane Keaton, now can we? Now that I can rationalize bows as being challenging and subversive, I am much more willing to incorporate them into my wardrobe. Here are some easy ways to do it. 1. A clutch: Lucky me, I just got a new ipad, and I am itching to make an oversized envelope-style clutch with a giant bow for a case. Simplicity 2166 and Burda 7543 could make good starting points, but will have to be scaled for the ipad. If you are less inclined to get crafty, there are loads of clutches for sale on Etsy and eBay- but even better, visit your local Goodwill, and scour the flea markets. I guarantee you will find some treasures! 2. Headgear: Some iterations may look more girlish than others, but barrettes, headbands, and hats can all be adorned with bows. Depending on your mood and overall theme of your ensemble, head-topping bows can be on any scale. Tiny bows on barrettes, or gigantic bows on an elaborately structured hat can be equally elegant. I did some quick searches in Etsy and I saw some really beautiful and inspiring pieces. The best search was “bow hat” filtered for vintage, clothing, and women- I found this gorgeous thing that I am very tempted to make my own. 3. Shoes: Footwear provides just as many opportunities for embellishment as any other accessory. This past fall season, Marc Jacobs adorned the toes of pumps from Louis Vuitton with restrained, flat leather bows. Dainty bows at the ankle can be very provocative- I have a pair of leopard-print heels that have corset-lacing up the heel, ending with a bow on my ankle. Bows are an inherent part of many ballet flats, gladiator sandals, and espadrilles. 4. Belt: The ultimate see-what-happens-when-this-comes-undone bow! This can include sashes on robes,ties on a wrap dress, belts that close with a bow, or belts that have bows as decorative elements. Truly, I think this is probably the most challenging of bows, because so much of an outfits success rides at the waistline. Think carefully about where you are drawing attention, and how. I think a small, neat bow. like the one on the belt I have pictured, is just about the perfect mix of soft and hard. Picture that over a tidy sheath with a cropped cardigan and ballet flats. You may as well just re-name yourself Audrey Hepburn- who played nuns and call girls equally convincingly. 5. Jewelry: We saw Bianca’s bow brooch- you can incorporate bows into pretty much and and every jewelry piece: earrings, necklaces, chokers, rings, bracelets, etc. Kate Spade released a series of giant bow bracelets that are incredibly chic- and relatively easy to copy, which is good because they were $175 and are now harder to find. Now that you have your inspiration, let’s figure out how to tie some bows! Who better to teach us than Martha Stewart? Martha’s site has a ton of tutorials on bow-tying; the one I’ve linked has instructions for her three favorite bows (single, double, and winged). You can see from the pictures that I posted that I am drawn to more structured-looking bows, but that doesn’t mean that you have to like those best for yourself. If you like a nice, big floppy bow- I say go for it (but refrain from putting it on your rear end, unless you are getting married, please)! So, drag out your ribbon stash, and get tying! I love those Louis Vuiton shoes. I love the chunky heels! 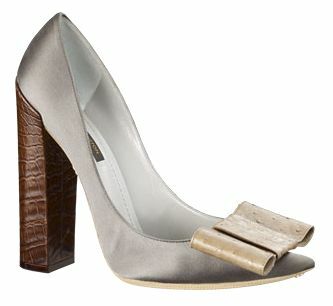 I loved those shoes the minute I saw the runway pictures- DSW has a knock-off in their clearance section online. And if you can find the right heel, it wouldn’t be hard at all to add the bow.